The Income Tax (I-T) department had earlier issued a final attachment order against Bharti and her husband in the benami assets case. 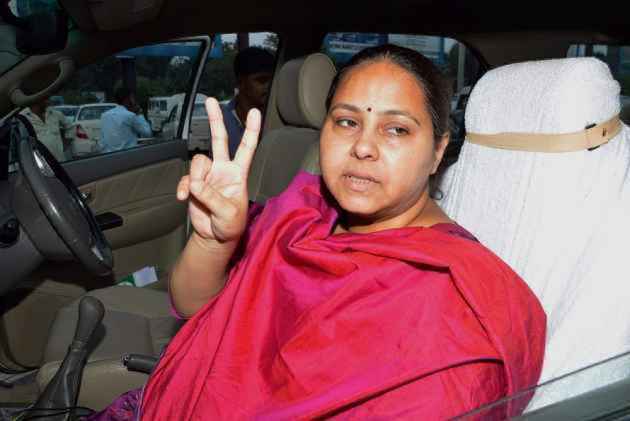 The Enforcement Directorate (ED) has filed a second charge sheet against RJD chief Lalu Prasad Yadav's daughter Misa Bharti and her husband in a money laundering case before a Delhi court, which today kept both charge sheets for consideration on February 5. Irked over the repeated filing of charge sheets by the ED in connection with its money laundering probe against Bharti and her husband Shailesh Kumar, Special Judge N K Malhotra berated the agency for not letting the trial begin. "Will you let the trial begin or keep filing complaints? How many supplementary charge sheets will you file? You are a premier investigating agency. You cannot behave like this. It is an ill-drafted complaint," the judge said. The court, which could not take cognisance of the charge sheet filed on December 23, 2017 against Bharti and Kumar, posted the matter for February 5 for considering both the charge sheets after ED special counsel Atul Tripathi sought time to make further submissions in the matter. Advocate Vijay Aggarwal, representing chartered accountant Rajesh Agrawal, who was also arrested by the ED in connection with the case, sought adjournment citing pendency of bail plea of brothers Surendra Kumar Jain and Virendra Jain, who have been accused of laundering crores of rupees using shell companies. Rajesh Agrawal was arrested by the ED following allegations that he mediated and provided Rs 90 lakh in cash to the Jain brothers in advance to invest in Bharti's firm Ms Mishail Packers and Printers Pvt Ltd "as share premium". The probe agency had earlier attached a Delhi farmhouse in connection with its probe against Bharti and her husband. The farmhouse, located at 26, Palam Farms in south Delhi's Bijwasan area was attached provisionally under the Prevention of Money Laundering Act (PMLA). It belongs to Bharti and Kumar and is "held in the name of Ms Mishail Packers and Printers Private Limited", the central probe agency had said. "It was purchased using Rs 1.2 crore involved in money laundering in the year 2008-09," it had alleged. The agency had in July last year raided several locations, including the farmhouse, as part of its probe against the Jain brothers and others. The Jain brothers were arrested by the ED under the PMLA. One of the firms that the arrested duo were linked with was Ms Mishail Printers and Packers Private Limited. The ED had alleged that Bharti and her husband had served as directors of this firm in the past. "The company, Ms Mishail Packers and Printers, was registered at the address 25, Tuglak Road, New Delhi till the shares were bought by Bharti. "It was only during the year 2009-10 that the address was changed to farm no 26 Palam Farms, VPO Bijwasan, New Delhi. Bharti and Kumar were the directors of the company during the relevant period," the probe agency had said. The couple were also interrogated and their statements were recorded by the agency in this probe case. The agency said the Jain brothers, CA Agrawal and the daughter and the son-in-law of the former Bihar chief minister were the "key persons behind the money laundering of Rs 1.2 crore".